Hanover calls for ‘top-notch consultant’ to help realize HMS recommendations. 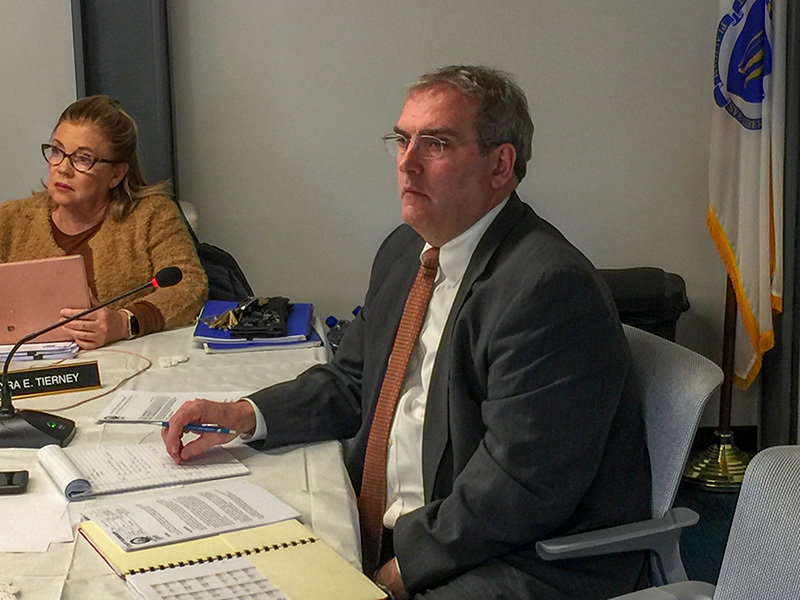 Just one month after a consultant suggested staffing changes for the Steamship Authority, general manager Robert Davis backed securing a director of marine operations at a special double meeting in Falmouth Tuesday. The board will vote on the six-figure position at the next monthly meeting in February. Davis also backed a health, safety, quality, and environmental protection (HSQE) director, but could not reach a consensus with the board on the position. Former general counsel Steve Sayers, who has been the SSA’s liaison to HMS, told the board HMS sent a letter expressing interest in changing gears to help implement the recommendations it put forth in its report. Board chairman Robert Jones and New Bedford representative Moira Tierney took issue with that possibility. Jones pointed out he was discouraged HMS has yet to come through with the communications portion of its report, and questioned whether HMS has established a track record that merits further business. Tierney said she felt it was a conflict for the company to try to implement the recommendations it made in its report. The board did not put the idea to a vote. The SSA has still not scheduled a meeting on Martha’s Vineyard, where the decision to hire an outside consultant was pushed for after a series of mechanical breakdowns resulted in more than 500 trip cancellations in the first four months of 2018. Last month, HMS Consulting recommended sweeping changes for the authority based on its top-to-bottom review. Hanover said while he did not agree with all of the consultant’s human resources recommendations, installing them or a portion of them will save the SSA a “substantial amount of money.” He pointed out the frugality HMS said the SSA suffered from. “The report also said they felt penny-pinching has put us in this situation,” he said. In an interview after the meetings, Davis said looking to the legislature is a possibility for extra funding. The SSA is actively exploring state and federal programs that may “assist us in coming up with some operational funds,” he said. The SSA has been without a port captain since Charles “Greg” Gifford retired last year. Davis told the board during discussion on positions that needed to be filled that HMS requested he not hire a new port captain until the report was generated. In his written report to the board, Davis suggested hiring a planner instead of spending $125,000 on an outside consultant in order to craft the strategic plan HMS said was needed. “The planner could also be an additional resource for studying numerous other projects that have consumed or otherwise would consume the time of the management staff, such as the feasibility of providing freight service from New Bedford and barging municipal solid waste from Martha’s Vineyard …” Davis wrote. The planner could attempt to identify state or federal funding while working with the Island communities, he wrote. During the second of the two meetings, Ranney threw his support behind Davis’s planner suggestion. Davis also made a pitch to keep the assistant port captain position. The position serves “great value” as a “liaison between our fleet personnel and the incoming port captain and director of marine operations,” Davis wrote. Jones announced that Falmouth member Elizabeth Gladfelter resigned her position via a brief letter. He did not indicate what reason she put forth for bowing out, but said, “I think she was a very valuable member of this board.” He noted Falmouth selectmen have yet to appoint her replacement. Jones also pointed out the treasurer/comptroller position is vacant after Gerald Murphy’s anticipated resignation occurred. Davis volunteered to assume his work until the position could be filled. Updated to include more details from Tuesday’s meeting. -Ed. How about a Chief Operating Officer position at the SSA? This was one of the external report’s major recommendations. So Robert Davis volunteered to assume the duties of the vacant Treasurer/Comptroller? Why doesn’t he go back to that role and the SSA hire a real General Manager? Marc Hanover is right — 60 days have gone by and zero progress has been made by Davis.